Horses line up at the starting gate this May on the hunt for the coveted Triple Crown of Thoroughbred Horse Racing. One of those races, the Preakness, takes place right in our own backyard of Baltimore, but Frederick also has its own ties to a famous horse. The Tivoli Theatre, known today as the Weinberg Center for the Arts, was the first building in Frederick to be air conditioned, thanks to a racehorse named Challedon. When the Tivoli first opened its doors it was the second largest structure in Frederick. It could comfortably seat 1,500 people, had a 16-foot movie screen, and could accommodate live performances with an orchestra pit, a large stage, 50 sets of pulleys for scenery, and dressing rooms. The building was designed with one of the finest ventilation systems available. It had large built-in fans and blowers which circulated fresh air in the auditorium and other areas of the theater. However, Frederick’s hot and humid summers still made the building uncomfortable for patrons. One local resident who frequented the theater in the 1930s said, “It could get as hot as blazes in there in the summer. Imagine it when it was full of perspiring people.” Unfortunately, to install air conditioning would have cost more than $100,000 and the owners simply could not afford it. In 1940 the Tivoli was finally able to install air conditioning, all because of a racehorse named Challedon. The horse was born near Walkersville at Branncastle Farm, now Glade Valley Horse Farms, in 1936 and was racing by the age of two. 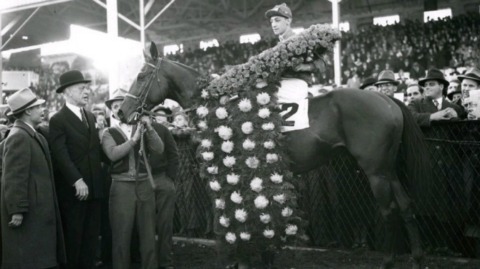 In 1940 Challedon traveled to California to compete in the Hollywood Gold Cup and was accompanied by his owner, W.L. Brann and two of his closest friends, including Frederick surgeon Edward Thomas, who also happened to be a patron of the Tivoli. At a pre-race party, Warner Studio head Jack Warner was overheard saying he was going to bet $50,000 on the favorite. Thomas persuaded him to bet on Challedon instead and when Challedon won the race, Warner wanted to share a portion of his winnings. “Dr. Eddie,” as he was known, begged off, but Warner persisted that he wanted to show his thanks for the tip. Thomas’s request was for air conditioning at the Tivoli, the theater that Warner Brothers owned in Frederick. Warner made good on his offer by contacting one of his subordinates in New York and arranging for the installation. The Tivoli became the first building in Frederick to be air conditioned and that same year Challedon earned U.S. Horse of the Year honors for the second straight year. It is often said that for many years afterward, the Tivoli’s air conditioning attracted more people to the theater than the shows did.